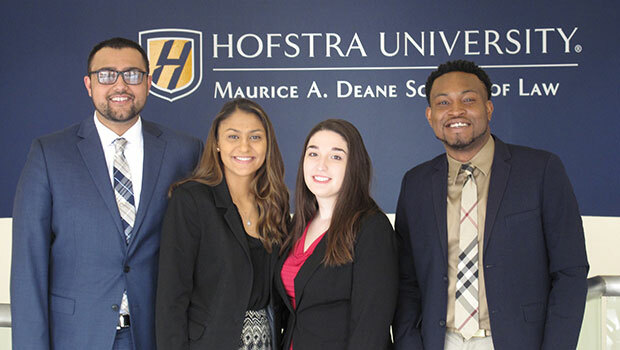 Four Hofstra Law students have been selected to participate in the New York City Bar’s 2019 Diversity Fellowship Program. First-year students (left to right in photo) Jacob Manzoor, Dawn Sudama, Faith Pappalardo and D’Andre Chapman will have the opportunity to spend their summer working at one of the participating law firms and corporate law departments. The selection criteria for the fellowship were demanding. 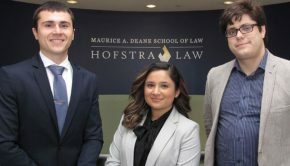 After completing a legal writing requirement, preparing a personal statement and being interviewed by a Hofstra Law screening committee, the students were then interviewed by a panel of attorneys and other school representatives, who reviewed the candidates’ undergraduate and law school transcripts, resumes, personal statements and legal writing samples. The students were able to clear all of these hurdles and receive an assignment from one of the participating employers. Founded in 1991, the Diversity Fellowship Program provides first-year law students from underrepresented populations the chance to spend a summer in one of New York’s leading law firms and corporate/government law departments. Hundreds of diverse and talented first-year law students from 11 New York City-area law schools have been given a rare and valuable opportunity to jump-start their careers in the law by spending their 1L summer at one of the outstanding participating law firms and corporate law departments. 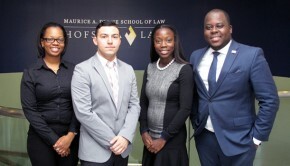 Hofstra Law has had 82 Diversity Fellows since the program’s inception. Program alumni have achieved success at all levels of the professions, including as law firm partners, general counsels, assistant district attorneys, assistant attorneys general, entrepreneurs and executive directors.